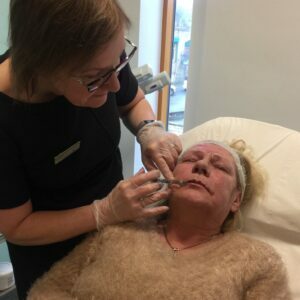 Profhilo is a stabilised & natural hyaluronic acid (HA) without any chemical cross-linking agents that is used to remodel the skin, treating skin laxity and fine lines and wrinkles. 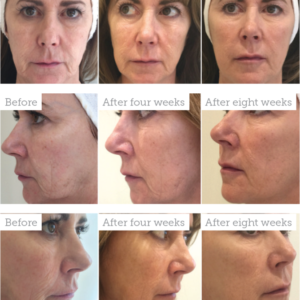 The procedure offers dramatic improvement in tissue quality, even in challenging areas, and is complementary to other aesthetic treatments such as Botox and Dermal Fillers. It can be used on the face, neck and other areas of the body. PROFHILO® is considered one of its kind and a true breakthrough in Anti-aging medicine. We use a technique called BAP (Bio Aesthetic points) where 5 implant points are injected on each side of the face. PROFHILO® is injected to the lower third of the face where dermal atrophy is experienced with age, diet and lifestyle. Minimum injection points will reduce the number of visits and also minimises patient discomfort. Before we proceed with the treatment, we will do a thorough consultation. Effects of this revolutionary technology are increased firmness, elasticity and a general rejuvenation that lasts up to 6 months. This will depend on the severity of skin condition, lifestyle and age. It is recommended to have 2 sessions with a 1 month interval between treatments. Maintenance sessions are recommended depending on how you respond to the treatment. PROFHILO® has minimal side effects and is a pretty safe procedure however the patient may experience erythema, redness, swelling, itching and discolouration or tenderness in or around the implant site. As with most injectable procedures, the patient may experience a slight stinging sensation at the implant site however with the PROFHILO® procedure, minimal injection points are required. Who will perform this treatment? Our senior aesthetic practitioner will help you decide whether this is the right treatment for you at the consultation. If you decide to go ahead, we will book you in with our registered nurse practitioner will administer this treatment. She comes with a wealth of experience and is passionate about the procedure. The procedure is £899 which includes 2 sessions with a 1 month interval.